"Although the Normans were the descendants of the Norse war-band of Hrolf the Ganger and had only been settled in France for about 150 years, they had profited enormously by their contact with the French. Most important, they had learnt the art of cavalry warfare. By 993 the Norman contingent in the French army fought on horseback. The horse had carried the spearman into battle for many centuries but the spear had been used over-arm to thrust or had been thrown in the same way as the infantry spear. Now men began to tuck the spear under the arm, thus adding the weight of the rider and the speed of the horse to the force of the blow. This use of the spear probably developed because, due to the introduction of the stirrup, the rider sat more firmly in the saddle. Cavalry must be taught to manoeuvre together as a body, and this cannot be done hurriedly at the beginning of a campaign. Thus we find that, unlike the Saxons, who, with the exception of the housecarles, served only in time of war, were called out in time of peace also." "[A]rmor protected relatively effectively against contemporary weapons. King Henry himself twice escaped injury thanks to the strength of his armor: his aerea cassis, or bronze helmet, deflected a stone from his head in a fierce fight outside Laigle in November 1118, and his capitium loricae, the collar or headpiece of his hauberk, saved him from a sword stroke to the head at Brémule." "Most men in Norman England went bareheaded. For inclement weather, however, or for older men, the Phrygian cap was still the commonest head-covering. 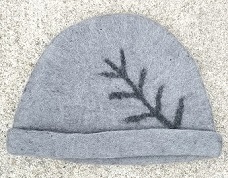 Alternatively a felt or woollen flat cap was worn or a hood attached to a shorter cloak. The latter style was used mainly for travelling." "The most important piece of defensive armor for Anglo-Norman soldiers was the hauberk, a shirt of chain mail. Mail required skill and a good deal of time to manufacture, and was therefore not an item bought in bulk either on county farms or very often king's chamber account. In all likelihood the mail shirt and the conical iron helmet which complemented it were supplied not by the employer but by the employee in twelfth century warfare. That is, each soldier provided his own armor. Undoubtedly some professional soldiers did not own a mail shirt and wore only the quilted gambeson which normally went under the mail (though they would not then qualify as milites, or knights); some members of the fyrd were probably incompletely armored, for instance. But most would have counted mail among the necessary equipment, along with helmet, sword horse, of a professional soldier. Mail was durable and was handed down from man to man, and could be repaired with damaged." "The armour of the Normans differed very little from that of the Saxons. Their mail shirt, which they called the 'hauberk', was usually knee-length and slit up to the fork of the legs so that the skirts could hang down on either side of the saddle. Most illustrations show a tight-fitting mail hood made in one with the shirt. 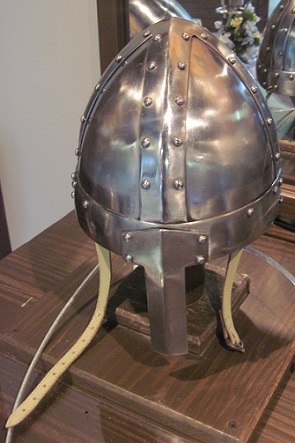 Some hauberks were still used without hoods or were worn with what may have been cloth or leather hoods. A few of the leaders in the Bayeux Tapestry have cuff-length mail sleeves and mail hosen worn under the hauberk, but these were rare. The hauberk was worn over a long garment rather like a nightshirt which can have given little protection against the weight and rubbing of the mail. One feature observed only in the Bayeux Tapestry and in two manuscripts is a rectangle on the breast, outlined in colour and apparently sometimes with laces or ties hanging from the corners. No one knows for certain what this was but it may represent an additional layer of mail or an extra reinforce of some sort over the breast, or it may have been the flap which closed the neck opening." "The mail hauberk grew in size (it now weighed up to 15 kg/33 lb), reaching the knees, and full-length sleeves were added." "Although it is called a lance, Norman knights used what could more accurately be described as a long wooden spear with a simple, spiked end. It would be held firmly under the arm in order that the maximum force of both man and horse could be transmitted into the charge. Once the enemy had been engaged, the lance could also be transformed into an effective close-combat thrusting weapon, or simply thrown." "The head of the lance was commonly of the leaf form, and sometimes approached that of the lozenge; it was very seldom barbed, although this variety, together with the others, appears upon the Bayeux Tapestry. The horizontal bar-guards, so characteristic of the Anglo-Saxon spear, are very rarely see at times in the MSS. written subsequently to the Conquest. Nearly all the Norman spears were embellished with pennons of from two to five points. The length of the spear appears to have differed little from that of the Anglo-Saxon, and like that weapon they were of uniform thickness throughout." "Pictorial records of the 11th century, such as the Bayeux tapestry, depict both foot soldiers and horsemen with clubs or maces. The latter use some kind of elongated pear-shaped club but no more details about it can be deduced from the tapestry." "At Hastings the Saxons appear to have used the stone hammer and the Normans a mace having the head heart-shaped; they had recourse to this after the lance had been splintered." "Remembering that the Normans were essentially a Scandinavian nation, we might fairly expect to discover traces of their origin in the sword of the period, and this we find to be the case. It was still straight, long, and double-edged, slightly tapering towards the acute-angled point. The quillons were straight at the time of the Conquest, but became bent in a small degree towards the close of the period; the grip was without swell, and a spherical knob formed the pommel. The scabbard was suspended upon the left side by a small cord round the waist, but occasionally was supported by the hauberk being passed through a hole in the garment, which thus concealed a portion of it." "Like its immediate predecessors, the Norman sword was straight, double-edged and suitable for slashing or thrusting. Cross-guards or 'quillons' were short and either straight or inclined slightly towards the blade. Most of the pommels appear to be disc-shaped or round, but some surviving examples, possibly from elsewhere in Europe, are of flattened or 'Brazil-nut' shape." "The sword used by the Normans was similar to that of the Danes but usually had a rather longer, straighter guard above the hand, and the tea-cosy-shaped pommel was longer and more like a Brazil nut in form. It was carried in a scabbard on a wide loose waist-belt which the weight of the sword pulled down low over the left hip. The belt was buckled or knotted at the front and was occasionally worn under the hauberk, presumably to prevent it being cut. In this case the sword hilt emerged from a slit in the hauberk." "A double-edged, razor-sharp broadsword with an average length of around 75cm (29.5in), was the main battle weapon of the Norman knight of the medieval period. It was ideal for swinging at speed and downward slashing. It would be used one-handed and in conjunction with a large, kite-shaped shield." "The rider's left side was protected with a kite-shaped shield, which was held in the hand, but, because of its great weight, the shield strap was slung over the right shoulder." "The mounted man is particularly vulnerable down the left side. 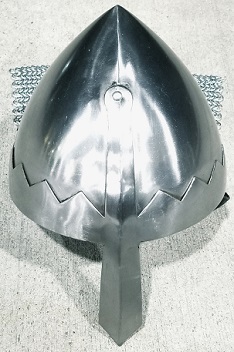 He can protect his right side with his sword but the left side must be covered by his shield, and for this purpose a long shield is better than a round one. In consequence a long kite-shaped shield was developed which covered the body and most of the left leg. It consisted of wood, probably covered with leather and bound with steel bands, usually with a boss in the centre of the upper part. The left forearm passed through a square of straps at the back of the shield, and the hand grapsed a handgrip. There was also a long strap, called the 'guige', which went round the neck over the right shoulder and supported the shield when not in use and took part of its weight from the left arm in action. The surface of the shield was covered with abstract designs, or crosses, or series of dots, and in some cases by winged dragons, but at this time no sign of systematic heraldry can be seen." "Under the gambeson or the hauberk or both was worn a tunic reaching nearly to the knees, and as a rule a little longer than the defensive garments." "The masculine tunic, at the time of William I, was little changed from the Anglo-Saxon version. There were still two lengths: knee-length in common use for all in everyday life, and ankle-length for the best dress of a nobleman. Apart from this two two styles were similar; decoration was mainly confined to border patterns of squares, circles, and other geometrical motifs, embroidered at the hem, sleeve edges, neck edge, and opening; sleeves were long, fitting or loose, three-quarter or full length, and usually fuller at the shoulder; the neck was round, and slit in front to permit donning over the head; the whole garment was loose-fitting and confined at the waist by a leather belt. Sometimes the skirt was slit up the sides, often showing the under-tunic at the bottom. Frequently several tight-sleeved under-tunics were worn, according to the rank of the wearer, and the weather conditions. The king, on State occasions, wore an ankle-length super-tunic of richer material and decoration. This was known as a dalmatic, a survival of the Eastern garment of similar name. Its belt was usually studded with jewels. During the reign of William II, the short tunic became longer and fuller, and the ankle-length style evolved into a long, trailing garment, held up in front or tucked in the belt to enable the wearer to walk. 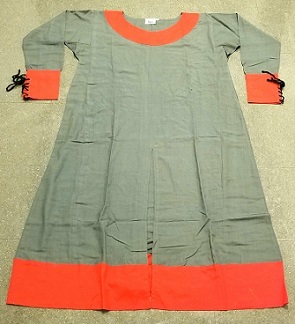 Sleeves also lengthened and eventually completely enveloped the hand. These modes continued into the reign of Henry I, become more ludicrous and unwieldy until, towards the end of his reign, Eastern styles, introduced by returning Crusaders, influenced the mode."